Around 20th April September the wait will be over. The fourth wealthiest movie character (according to Forbes magazine) will star in a Wall Street sequel. Wall Street is a 1987 drama directed by Oliver Stone. The two main stars were Michael Douglas as a wealthy investor / corporate raider / speculator Gordon Gekko and Charlie Sheen as young upcoming stockbroker Bud Fox. Douglas won the Academy Award for Best Actor in 1988. Gordon Gekko is best known for the famous line »Greed is good«, that was delivered at the Teldar (the company that Gekko wants to take over) annual stockholder's meeting. This line and Gekko himself symbolized the excess and greed of the 80s. However both were used by many authors in the last couple of years when discussing main reasons for worldwide economic downturn. What was all about? 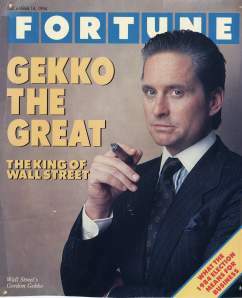 Twenty-three years ago, Fortune magazine cut a deal with 20th Century Fox to have a mock magazine, with Gekko on the cover. Oliver Stone wanted to use a Fortune magazine cover in exchange for promotional ads but Forbes magazine made a similar offer. The filmmakers stuck with Fortune and that upset Forbes publisher Malcolm Forbes, who turned down a later request to use his private yacht. 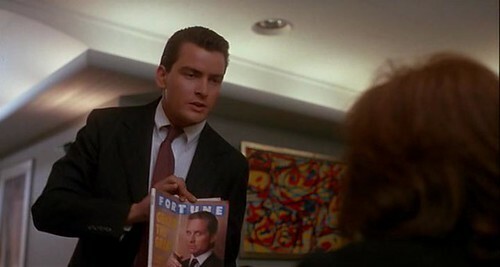 Fortune magazine was included in the part of the movie just before Bud Fox (Sheen) first meets Gekko. Bud takes out an old crumpled Fortune magazine cover of Gordon Gekko, entitled “Gekko the Great!” out of his bag. So, Fortune magazine was described as “the bible”. Not bad. But if the roles were switched and Forbes would have won the product placement deal, there would probably be the same effect. The product was nicely integrated in the movie and also symbolized the determination of Bud Fox – he wanted success, he wanted to be the best and I’m sure he was honest when saying that the Fortune magazine was his bible. Well, the dispute between Fortune and Forbes over this product placement was obviously settled long ago. In 2006 Forbes even called Wall Street the best movie ever made about money.